I just love caramel :D, that’s why the recipe name instantly catch my attention. 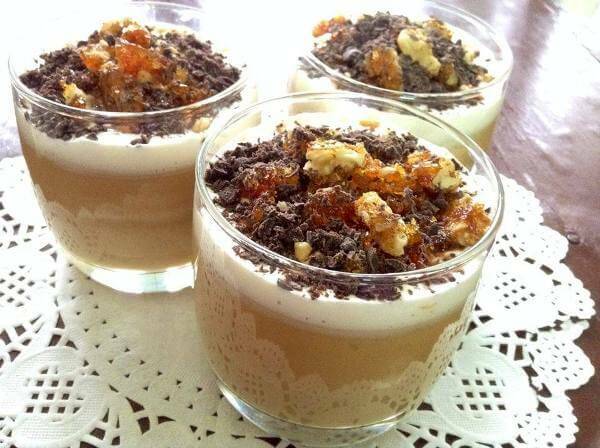 Toffee Custard With Walnut Praline is just amazing with a delightful taste. This is a tried and tested recipe by my friend Shazia Babar. In a pan, add in the sugar and caramelize it on low flame stirring often. Once it caramelizes, add in the butter and walnuts. Stir well, transfer the mix to greased plate, and let it cool. Once it is cooled, take it out from plate and then crush the praline disc to small chunks consistency. Melt butter in a pan on low heat, add brown sugar till it melts and bubbles. Add boiled milk (be very careful at this stage) and stir till sugar melt and combine properly with milk. In cold milk dissolve custard powder, add this custard mixture in hot milk and stir till thick. Turn off the flame and add vanilla essence. Pour the custard in individual glasses or in a serving bowl. Let it cool at room temperature (always cover the bowl or glasses with cling film or foil, if u don't want a thick layer formed on top of custard). If you want, add a layer of whipped cream on top of the custard and sprinkle the walnut praline and chocolate shavings on top.